Graphic Designer Brian Dove joined me at Southern Railway Taphouse to chat about life as a creative at a digital marketing agency. If you’re wondering what happens when you let elementary school students design a video game, or how a visual artist can thrive in a business setting, you’ll get your answers below. D: What’s your formal design background? B: I have a degree from VCU in Kinetic Imaging, which is a blanket term for time-based artwork. The three focuses of that department were video, animation, and sound art in a fine arts context, rather than a practical or professional study. But then there were also classes on performance art and interactive installation art. D: So why the distinction between fine art and professional? B: The program wasn’t designed exclusively to teach technical skills. It was more about exploring the medium creatively, making a body of work—gallery-based art more than helping you get a job as a cameraperson on a film set. D: Was that division a decision-point for you? B: I went to school thinking I was going to study studio or commercial photography. I never really considered myself an artist until I went to school. I always considered myself a creative, but not a visual artist. My immediate plan after graduating college was to go work on a farm, which I did for a year. 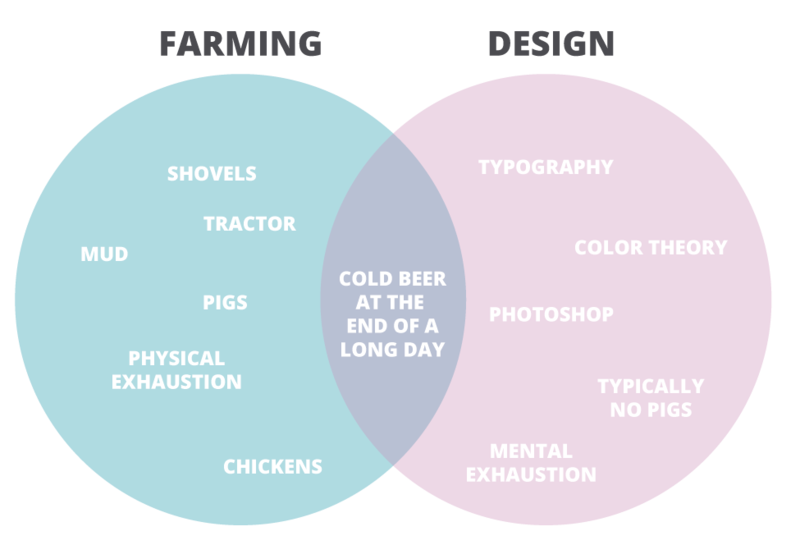 I knew I was either going to do something in design or farming for the rest of my life. Even when I was looking for jobs in Richmond, they were jobs in design or video or full-time farming positions. But I always had a sense I would come back and do something related to my degree. Farming is a more visceral, physical satisfaction—getting done with a hard day of work and collapsing and having a beer and taking a shower. As a designer, I still feel that way, but it’s my brain that’s exhausted now rather than my body. There’s definitely some overlap in the gratification Venn diagram, if I were to make that. D: Were you doing any freelance work during that year? B: I made a website for a friend of mine, who was a wedding cinematographer and photographer. I did his logo and branding package. That was probably my first step into the marketing or branding world. I had no formal training in marketing or branding. I had some friends that went through the advertising program at VCU and learned a little bit vicariously. D: How were you making design decisions without much structure or process? B: I would send him stuff frequently. There was a lot of collaboration and feedback from him. I did research on his company name, which is Birchfields, so there was a lot of bright, natural imagery. I also did some research on competitors in the industry. I don’t know if I thought about it as a formal process, but I didn’t know much about wedding photography. I wanted to see how to follow popular trends in the design community but also push them and do something different. I don’t know if I nailed that objective. He probably needs a redesign. I coded the whole thing from scratch with one semester in web design. D: You coded it from scratch? It’s not on a CMS? For some reason, that was so much easier to me than learning how to set up WordPress, which probably isn’t the case. I like coding from scratch, I’m just not that good at it. I don’t do much coding here. I do a little bit of CSS, sometimes. I wish I had picked it up sooner but don’t know if my brain is wired to be really good at it. D: Any other freelance work during that time? B: I also did a pretty cool project in Oregon with an alternative private school in Portland, teaching an after-school class on video-game making. I made a game with the kids that was motion controlled with the Leap Motion controller. 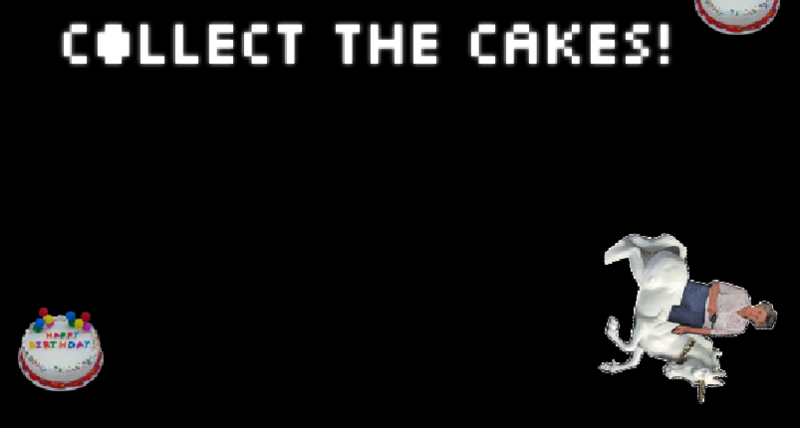 The game is called Cake Monster. It’s all made out of magazine cutouts. It’s so weird. It’s good. D: Did that project feel like a bridge between the creative and professional? B: For sure, and it was way more creative than I thought it would be, too. It was very collaborative. I gave a presentation to the whole school to see who would be interested and about five or six kids showed up—out of 70—and we made the game together. They concepted it, and we cutout and collaged all the assets that made the game from old magazines, then I scanned them in and created the game, and we came together to play it. It was something I was getting paid to do, but it was a different kind of gratification than if someone had commissioned me to make that same project. It was simultaneously limiting because I was working with kids but also bonkers because their minds run wild. The only prompts were the magazines I brought in. There were technical limitations—like the character moving on an x–y axis, collecting things, and being able to get hurt—but other than that it was totally open ended for a bunch of 8–12-year-olds with wild brains. D: Before you took this job, did you have any anxiety about working at a marketing agency? B: No initial reservations. Honestly, I was looking for a design, video, or web job to build my resume because I had not had a full-time media position. I’m glad that it’s been a really good fit. I felt pretty comfortable immediately—all these people seemed cool, the place seemed cool. There were definitely anxieties about whether I was going to be good enough at doing this. D: Anxiety because it was a new industry to you? Or about your creative skills? B: All of the above. Everything. I had no marketing background. I don’t even know if I knew what landing pages were. I didn’t know anything about ad sizes—none of the technical background. All the portfolio stuff I submitted was weird abstract art, video, and games. I also had never worked in a nine-to-five office setting. D: Do you know why they hired you? B: I think maybe seeing the wide variety of things I presented—websites, video, animation, show flyers—having all of that may have been attractive since they needed someone to do so many things. D: Have there been times when you were surprised by the atmosphere? When it went from endure to thrive? B: It was a pretty immediate “I feel really good here.” Company culture–wise, the fact that most of us are pretty close friends is pretty weird. It’s great, but it’s really unusual. It’s awesome. We’re really lucky. Company culture–wise, the fact that most of us are pretty close friends is pretty weird. It’s great, but it’s really unusual. Coming from a fine arts background, I think I was still pretty skeptical as to how much I would like making ads and landing pages. D: Do you like it? B: The things that excite me the most are still the larger internal projects, like redesigning our website, which will launch early next year and has been so satisfying, as well as making employee spotlight and client story videos. But at the end of the day, I’m still making stuff every day. That’s what I’ve always wanted to do. My technical skills have gotten so much better in the last year, which is great and applies to everything, including personal work I do. Even when I don’t have that much creative freedom, I’m still learning and getting better. My technical skills have gotten so much better, which is great and applies to everything, including personal work I do. I’m looking forward to when I’ll have at least one design teammate to bounce ideas off of and review work with. Client feedback doesn’t always make it back to me. Sometimes it stops at the analyst, but I need to learn what the client likes or dislikes about it, learn their aesthetic. Very rarely do I turn something in to an analyst or client and say “There it is, it’s done, it’s good.” Usually, I’m asking them what they think. I’m not going to get offended if they don’t like it. I spent four years in art school getting my personal work torn to shreds, I can handle constructive criticism. D: That’s the challenge of balancing the creative with the technical, right? I will always enjoy the more heady, creative projects. But for now, it’s a good balance. Sometimes, I don’t want to work on something so open-ended. I want to sit down, put on headphones, and make some ads. B: I might get more burnt out more quickly, which is probably why I haven’t so far. D: You probably have other creative friends. Do they ask you about your job? Do you feel proud of the work you do? B: When I was in the middle of my college career, a lot of people would say, “I’m never selling out. I’m going to make art for the rest of my life, and do my own series, and go in this gallery and that one,” and they quickly realize it’s not easy to make that lifestyle financially sustainable. I’m grateful and proud to be doing work that is creatively stimulating, to be honing my skills every day. It’s improved the quality of my creative pursuits outside of Workshop. I love making stuff, and every day I come to work and I make stuff. I’m extremely proud to say I work as a graphic designer at this company. I love making stuff, and every day I come to work and I make stuff, whether that’s a goofy video for Workshop or simple banner ads. If this were a very buttoned-up place, I might not enjoy it as much. But I love doing the work I’m doing because of the place I’m doing it in and the people I’m doing it with.